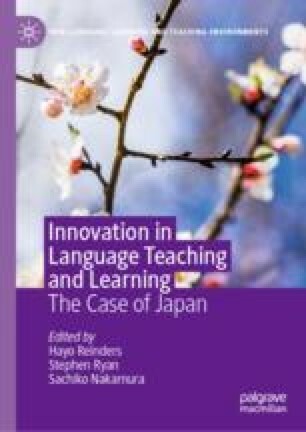 The present chapter focuses on digital games as a potential means for learning English among children in Japan. A group of children (sixth-grade students, ages 11–12; n = 82) were asked to conduct the following activities: (1) identify game elements (elements that motivate learners to engage in games) and learning elements (elements that promote learning) by examining existing digital games; (2) develop digital game plans for learning English vocabulary in group settings; and (3) conduct self- and peer-evaluations of their own plans. A digital game developed based on the children’s ideas was evaluated by fifth grade students. Based on the project’s results, the present chapter aims to better understand the conditions that enable digital games to help children learn English from their point of view. MEXT. (2016). Shogakko-ni okeru gaikokugo kyoiku-no jujitsu-ni muketa torikumi [Plans for effective foreign language education at primary school]. Retrieved from http://www.mext.go.jp/b_menu/shingi/chukyo/chukyo3/074/siryo/__icsFiles/afieldfile/2016/03/22/1368720_5.pdf.